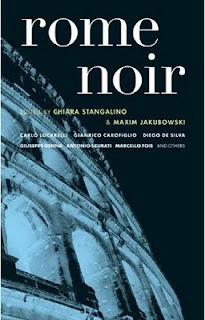 The reviews that I've seen for the Italian entry in Akashic Books excellent city noir series, Rome Noir, edited by Chiara Stangalino and the estimable Maxim Jakubowski, were almost entirely negative. Bruce Grossman at Bookgasm, here, complains that almost none of the entries are actually crime stories, and A. Ross complains at Amazon.com that none of the writers are from Rome or are much interested in portraying the city. I have to say that I agree with both. Rome Noir is the first of the Akashic collections that I've been disappointed with. After Bitter Lemon's excellent translation of Giancarlo De Cataldo's Crimini collection, I was salivating over the possibility of another crop of stories by hitherto untranslated crime writers and new stories by writers who are already accessible in English. I read on to the end of Rome Noir, though it was a hard slog in many cases, hoping that the next story would justify my hopes. The collection includes several stories that are really science fiction, a number that are noir in the moodiness and language but without crime as the centerpiece, and the two by well known writers (to an English-language audience), Carlo Lucarelli and Gianrico Carofiglio, are short and perfunctory. Giuseppe Genna, whose interesting In the Name of Ishmael has been translated, offers a conspiracy tale in line with the sensibility of that book, and Marcello Fois, whose historical mystery The Advocate is available in English, offers a tantalizing tale of an interrogation across lines of generation and gender. The best of the stories is Antonio Pascale's complex, almost novella-like, tale of greed and genrifiation. Several others were at least mildly interesting, but not really memorable. All of the stories are well written, and the editors are to be commended for including so many women writers (5 out of 16, which doesn't sound like much until you start comparing that proportion to other collections of translated crime fiction). Several stories turn on sudden twists that seem tricky or contrived, and the "crime" in a couple of them is actually suicide. What I initially missed in the collection was the "placed" noir writing of Crimini and other entries in the city noir series, and what occurred to me later, while mulling over my disappointment, was that the collection gave a sense that the writers were more interested in "writing," in an intellectual sense, than in the genre to which they were ostensibly contributing. Not that good writing and intellectual writers cannot create great noir fiction (they can and do), but that seemingly these and certainly other writers who dip into noir without giving its history and terms due consideration (even in the violating of them) don't frequently achieve great noir or great fiction. Has anyone else read this collection? Any comments about it, or other volumes in the Akashic series, or other collections of noir short stories?